In a large frying pan over a medium-high flame, add in vegetable oil and allow to get hot. Cook for 5 to 7 minutes on each side. They will begin to blister and char. This is exactly what we are looking for. Sprinkle the soy sauce over the top, and mix. Squeeze lime over the peppers and mix. Remove and place them on a plate. Enjoy! Serve with a side of lime for an extra tangy taste. Japanese shishito peppers are very unique. They are about the size of half a normal-sized carrot and quite slender. They are green and turn to red when they are ripe. Here's the crazy part… they taste sweet and savory. Not spicy at all! Actually let me correct that, about 1 out of 10 are spicy. This little pepper is super delicious and addictive. Since I've discovered them, which was very recently, I've been frequently eating them as a snack. 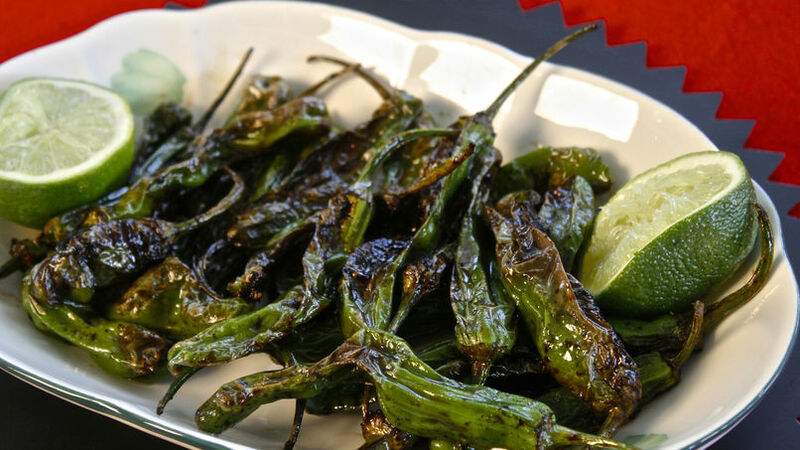 I like to munch on them after I grill them in front of my family and friends and they can't believe I'm eating what they believe to be a hot pepper. But after they give them a taste they are instantly hooked. I'm not kidding when I say you won't be able to eat just one!